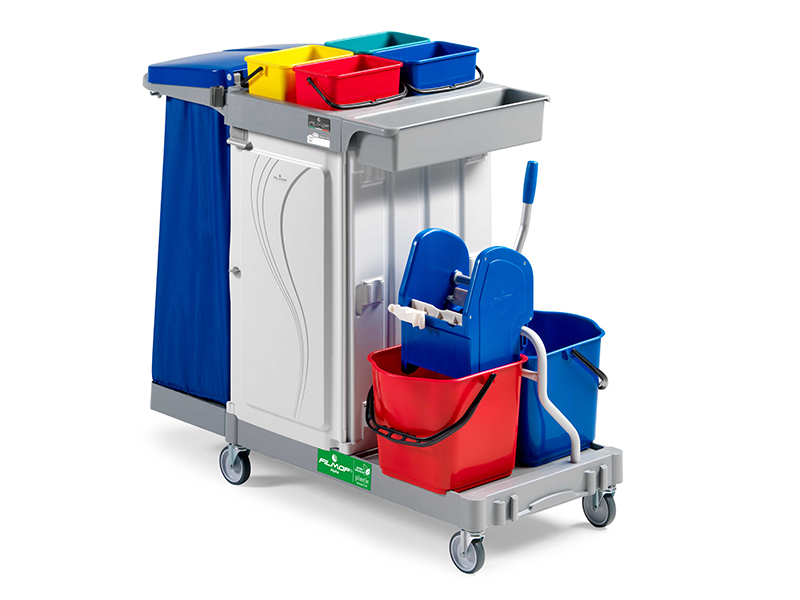 Multipurpose trolley ideal for the general cleaning of those environments that require dusting, waste collection, mopping and disinfection of floors and clleaning of surfaces: all in one single trolley! * Green: environment friendly as made of recycled “Plastic Second Life”polypropylene copolymer. stronger in case of a fully and heavy loaded trolley. * Bagholder equipped with ergonomic push-bar, handle supports and hook. * Bagholder available in different versions: 120 ltrs, 2×60 ltrs, 1×40 ltrs+1×80 ltrs, 3×40 ltrs. after its use (space saver bagholder). * 4-litre buckets in four different colours to separate the different chemical solutions and the tools and cleaning equipment in use. removable key, and of shelves. * Down-press wringer with plastic jaws, ideal for floor mopping with spaghetti mops and Speedy flat mop heads. section of our Alpha line of trolleys in order to know the complete range of accessories available and possible combinations.